just up the pike: downtown silver spring could get a business improvement district. what is a BID, anyway? 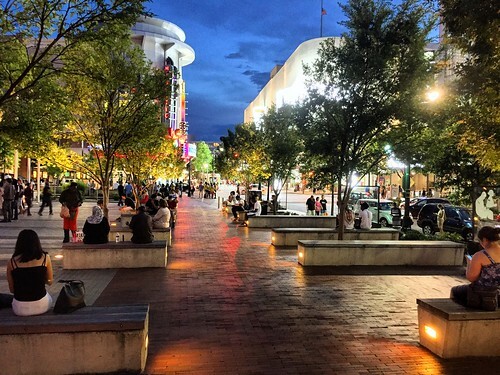 downtown silver spring could get a business improvement district. what is a BID, anyway? In order to attract new businesses and residents and better maintain the downtown area, a group of local businesses and property owners in Silver Spring want to start a business improvement district, or BID. But what is a BID anyway? A group of businesspeople and property owners want to give downtown Silver Spring a Business Improvement District. Photo by the author. A business improvement district is basically a nonprofit organization that manages a commercial area. They can provide a variety of services, like sidewalk cleaning, capital improvements, security, parking and transportation management, and social services. But they also work to market and promote an area, recruit new businesses, and retain current businesses. BIDs are created by local governments, and are given the ability to raise funding through taxes on commercial property owners. BIDs are pretty common in DC and Arlington, covering areas like downtown DC, Golden Triangle, Rosslyn, and Crystal City. Dupont Circle just started one, and at least five new BIDs are under consideration in Brookland, Congress Heights, H Street NE, Shaw, and MidCity (covering the area around 14th and U streets). These organizations can take a proactive role in their communities. NoMA’s BID is building new parks and commissioned a study to redesign part of the Metropolitan Branch Trail. Rosslyn’s BID is building a parklet to demonstrate how we can create more public open space, while the DowntownDC BID is advocating for zoning that would allow vacant office buildings to become apartments. BIDs are less common in Maryland. Until recently, state law required the approval of 80 percent of property owners in a given area in order to start one, making them very difficult to organize. In Montgomery County, the county has instead created three “urban districts” in Bethesda, Silver Spring, and Wheaton. Like BIDs, the urban districts maintain public spaces, provide improvements like plantings and public art, and schedule and support events and activities for the community. They also do some branding and outreach work —for example, the Silver Spring Urban District created a map of downtown attractions that was distributed to area hotels. Each of the three urban districts have an advisory committee comprised of residents and business owners, which the county council appoints. But unlike the area’s BIDs, the urban districts don’t do as much outside marketing, especially to attract new businesses. They also have receive funding from a variety of sources, including property taxes, developer fees, and revenue from parking meters, which can be pretty unstable. In 2015, Bethesda had to borrow parking lot revenue from Silver Spring because they aren’t collecting enough money to support their urban district. Meanwhile, Wheaton’s urban district is primarily funded by the county’s general fund. As a result, the urban districts often compete with other programs around the county for money. A group of local businesses and property owners are leading the push for a BID, which would raise money from a tax the Urban District already levies on downtown commercial property owners, but not homeowners. It would take over the role of the urban district, while also doing business outreach and promotion, attracting new companies to the area and publicizing store openings. It would also be able to do branding, similar to other area BIDs. While the group didn’t mention this, it could even take on a more active role in shaping the community, like the NoMA and DowntownDC BIDs. Steve Silverman, a former county councilmember who's advising the BID supporters, says a BID will help Silver Spring compete with other business districts in the region. "What [the urban district] doesn’t have, in our opinion, is sufficient money for promotions and marketing," he told Source of the Spring. “With the creation of so many BIDs in DC and in northern Virginia, the goal is to try to increase the amount of money going for promotions and marketing of downtown Silver Spring." In order to begin, the BID will need the support of 51% of the downtown’s property owners. It would also have a board, comprised of business owners, property owners, and potentially other community members. At a recent Silver Spring Urban District Advisory Board meeting where BID supporters presented their idea, some people expressed concerns that the BID would be unrepresentative of the community. While downtown Silver Spring is majority-minority and has a large Ethiopian community, a list of potential board members the group shared didn’t include a single person of color. As a homeowner and employee of two businesses in downtown Silver Spring, I’m open to the idea of an organization whose sole purpose is to care for and promote the neighborhood I live and work in. Today, the only voices we often hear from about downtown issues are residents of surrounding neighborhoods, whose concerns are often very different than downtown residents or businesses. That said, there are real concerns about representation, particularly when it comes to the Ethiopian community, which is a huge presence downtown, a major contributor to the local economy, and a potential branding opportunity. That’s a concern other BIDs around the country have struggled with. One solution may be setting aside seats on the board for different groups so that it’s actually representative of this community. Downtown has over 12,000 residents and over 32,000 employees, comparable to the downtowns of major American cities like Raleigh or San Jose, and there’s a huge benefit in giving this community a stronger voice, which I see a BID as doing. As proposed, this organization could build on the great work the urban districts are already doing, and could help more people know about the great things happening in Silver Spring so they can be a part of our community as well.